If you've notice a little radio silence from SN in the last few days, it's because we had a death in the family that took the wind out of our household sails for a bit. Our cat Ferris passed away on Wednesday night. 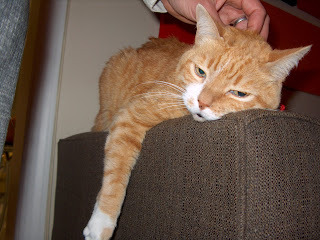 He was an affectionate friend for sixteen years and although he ate ribbons and left them in little barf packages by the stairs and once peed in my husband's shoe (where he then put his foot) - we loved him a little more than was healthy. As you know, this blog isn't about me so much as about our fair city, but I thought I'd make a small exception in order to highlight the good care Ferris received at Just Cats. They diagnosed Ferris' kidney disease early so we could keep him pain free for as long as possible. They also prepared us for what was to come, so that it was not a complete shock when he began to decline rapidly six months later. When I showed up in tears with our buddy's little body, they interpreted my ridiculous sobs and passed a tissue box across the desk. All around good choice if you have a kitty who needs competent medical care. I understand what it feels like to be unnaturally attached to a cat. When our buddy, Patches, bites the dust, I'll be sobbing, too. RIP Ferris and I'm sorry for your loss, Notes. Sorry for your loss, K.
Aw. I'm sorry. Having recently lost the best dog in the whole damn world, I feel a bit of your pain. Your sobs were not ridiculous, but completely understandable. Pets are members of our families, and the love and connection we feel for them is very real. Very sorry to hear about little Ferris. So sorry for your loss.I really appreciate all the posts you put up for PAWS. When you are ready we have tons of loving kitties waiting for a new home. Haven't been back in a while and just saw this. Ferris reminds me quite a lot of a cat we had as a child. Sorry to hear about this. That's hard. "That name again is Mr. Plow"
Did you see Jesse Jackson?